Jill’s sister, Elizabeth, is now on her way back to England after a brief visit here in Kentucky. She came in to the office yesterday and brought a few treasures that she’d collected and that she and I thought y’all might enjoy seeing as well. 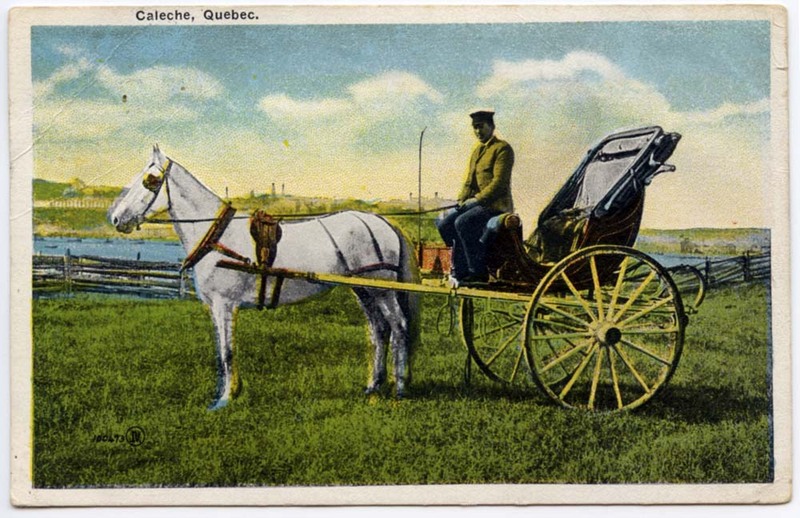 The first is this nice old postcard (postmarked 1920) of a Caleche in Quebec, Canada. According to Don Berkebile’s Carriage Terminology, the Canadian version of a “Caleche” is, as clearly shown in the image, “a two-wheel, chaise-like vehicle used in Canada. It has a small seat on top of the dash for the driver, and the inside seat holds two passengers.” The term “Caleche” was also used to describe four-wheeled Barouches.